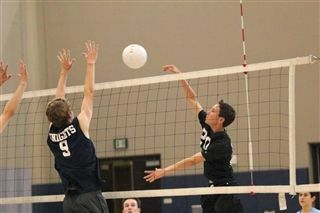 Boys Volleyball is off to a promising start this season in its first year as a Pacific Ridge CIF varsity sport. The Firebirds are currently ranked 2nd in Division 4 and own a 4-2 record, with both losses coming at the hands of tough Division 1 opponents. The team relies heavily on leadership from experienced senior and sophomore players, while a cadre of talented freshmen form the core of the starting lineup. According to Coach McCabe, "Despite the fact that most of the boys have limited competitive volleyball experience, they are making amazing progress and, more importantly, are having a lot of fun. I think we have a really good chance at a league championship if we continue to work hard and improve at our current rate." Boys Volleyball begins league play next Tuesday, April 21st at Del Lago Academy.